As the world reels from the latest senseless, tragic act of violence in Las Vegas, and the media and police scour the evidence for clues which might explain why this happened, it also seems wise to reflect and examine our own lives to discern if there be any violent thoughts within our hearts in need of cleansing. In today's politically fragmented and war-torn world it is the people of faith who are called to serve as divinely appointed peacemakers. But in our present hostile environment where do we start? Is there a blueprint for peacemaking? Yes! In fact, the Prince of Peace delivered His inaugural speech on the subject in the Sermon on the Mount, which, for those brave enough to base their lives upon His words, still hold the potential to change the course of human history, according to John Dear. Dear views the Beatitudes as Jesus' prophetic announcement of a new heaven-sent orthodoxy (correct beliefs) which should lead his followers toward inner transformation and a new orthopraxy (correct conduct) - thus birthing a new worldwide cultural transformation which brings the peace of heaven onto earth. The word 'peace' has many meanings. In a spiritual context it is best understood as the result of God's presence in a person's life. There are two different words used in Scripture for peace; 'Shalom' - mentioned 250 times in the Old Testament - means entering into a state of wholeness, unity, or a restored relationship. The New Testament Greek word translated as peace 'Eirene', is mentioned 91 times and often refers to the state of law and order. Both definitions of peace are vital, but sorely lacking in our modern world. Until we can plug into the source of inner peace, the prospects for external peace in the world system are very grim. This God-centered, peace-full heavenly Kingdom which Jesus proclaimed in the Beatitudes was intended to gradually fill the whole earth, but instead it become derailed by what Dear calls the "Anti-Beatitudes of War," which have been embraced by Christians and non-Christians alike for the last 1,700 years. Dear reminds readers that during the first 300 years Christianity remained faithful to the Beatitudes. The church remained an interactive, decentralized family of believers who gathered mostly in homes to share meals, fellowship, teaching and who numbers greatly multiplied - without the Roman empire's blessing. Then suddenly everything changed virtually overnight. According to Dear, "For three centuries Jesus followers refused to kill for the empire or hail the emperor as a god. For this civil disobedience, early Christians were sometimes persecuted and executed." "Then, in the fourth century emperor (Constantine) declared himself a Christian...and welcomed Christians into the Roman military. In a flash, the emperor threw out the Beatitudes and the Sermon on the Mount...justified mass murder, blessed killing for one's empire, and undid everything Jesus taught." Most of the church sank slowly into the world's system of building a vertical empire, rather than seeking first the righteousness, peace, joy of God's Kingdom. A small remnant of faithful Christians fled into the deserts of Egypt, Palestine, Syria and Arabia who chose to renounce the world under Constantinian rule (referred to as the Desert Fathers and Mothers). They were unwilling to violate Jesus' clear teaching in the Sermon on the Mount commanding His followers to cease from killing, violence and war in favor of healing, nonviolence and peace. The Constantinian empire nurtured a new culture of violence and war, which spread worldwide and to every nation - including those who officially embraced Christianity, yet refused to live by the simple, peaceful words of Christ recorded in the Beatitudes and Sermon on the Mount. Dear devotes the remainder of the book to calling Christians, and all humanity, to heed Jesus' Beatitudes of peace. For emphasis, I have included relevant quotes from other contemplative leaders and their reflections on the Beatitudes and Sermon on the Mount, including; Richard Rohr, Cynthia Bourgeault, Chris Teigreen and others which underline John's vital message of spiritual transformation as the pathway to a peaceful reformation. 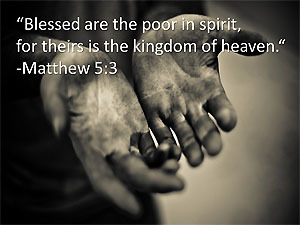 Blessed are the poor in spirit ... for theirs is the Kingdom of God. Dear begins his interpretation of the Beatitudes by explaining why it is difficult for we who live in first-world nations like the U.S. to understand what poverty of spirit, downward mobility and solidarity with the poor truly mean. John then recounts the stories of the violence and suffering endured by citizens of Afghanistan, a war-torn nation which globally ranks near the very worse in poverty, pollution, infant mortality and violation of woman's rights. "This beatitude confronts idolatry - of money, possessions, privilege and power," writes Dear, advising that we find God's blessing as "we share our lives with the poor and move into downward mobility, instead of seeking wealth." He views the daily practice of 20-30 minutes of peaceful meditation as a key to the doorway to poverty of spirit by preparing us to live in the present moment. "As we recognize our brokenness, woundedness, blindness and poverty before God, we receive the gift of humility," writes Dear. 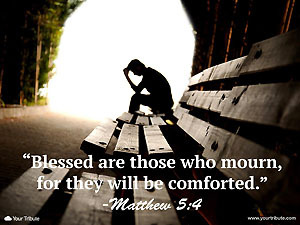 Blessed are those who mourn ... for they shall be comforted. Why does Jesus begin his greatest sermon talking about poverty of spirit and mourning, ponders John. "Perhaps because poverty of spirit and grief are the common experience of billions of people throughout history...and they are the doorway into God's presence...He blesses those who need it most." Humility and grief are often the daily experiences of peacemakers. "We will find ourselves in the powerlessness and emptiness of non-violent love, and thus feel universal compassion for all people, especially the poor, suffering and dying." "Jesus praises the weeping class, those who can enter into solidarity with the pain of the world and do not try to extract themselves from it. Jesus is saying that those who can grieve, those who can cry are those who will understand," says Richard Rohr in Jesus Plan For A New World: The Sermon on the Mount. "When we mourn we are in a state of freefall, our heart is reaching out toward what we have seemingly lost, but cannot help loving anyway...just as ice must melt before it can begin to flow...Tears have been a classic spiritual way of doing this," writes author Cynthia Bourgeault. "When we sit daily in silence with God and let our common loss break our hearts, we will find a deep spiritual peace the world does not know; and we will be given new strength to hear the Sermon on the Mount, join the grassroots movement for social change and welcome the kingdom of God in our midst," concludes Dear. 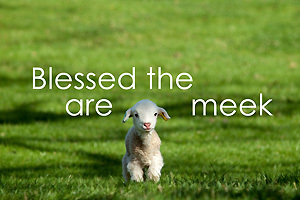 Blessed are the meek ... for they shall inherit the earth. John emphasizes that meekness does not denote passivity, but has been aptly referred to as "strength under God's control." This Beatitude is a quote from Psalm 37:11: "the humble (gentle, meek, nonviolent) shall have the land for their own". In Jesus Plan For A New World, Richard Rohr explains, "If there was one hated group in Palestine of Jesus' day, it was the landlords who possessed land. Nobody possessed land except by violence, oppression, and making the little peasants pay a portion of their harvest. Jesus is turning that around saying no, it's you little ones who are finally going to possess the land...Hebrew Scripture teaches that only God possesses the land, that we're all stewards, pilgrims and strangers on the earth." John reflects, "As I try to cultivate peace within myself and live in gentleness and nonviolence, I become one with creation. I am inheriting the earth." Dear believes we have much to learn from indigenous people who through their solidarity with creation can teach us to be meek, gentle, strong and courageous, yet nonviolent and to delight in the simple things of life and nature. 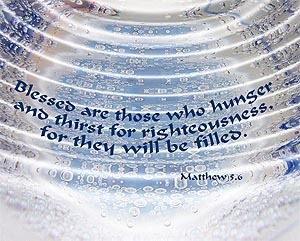 Blessed are those who hunger and thirst for righteousness (justice) ... for they shall be satisfied. Dear points out that the word used for righteousness is not just referring to personal integrity and holiness, but also the pursuit of universal social, economic, racial and political justice. "Here in the U.S., injustice surrounds us...homelessness, malnourished children, racism, sexism, mass incarceration without rehabilitation...every day 287 adults are shot in murders, assaults and suicides and unintentional shootings. "This Beatitude is both spiritual and social," says Richard Rohr. "We are to thirst for justice. To live a just life in this world is to have identified with the longings and hungers of the poor, the meek and those who weep...What real prayer does is stir holy desire but not always satisfy it." Jesus promises for those who hunger and thirst for righteousness and justice that he will be "living bread" and "living water". Dear admits the struggle for justice may take a long time, but we know truth is on the side of justice. "The arc of the moral universe is long," Martin Luther King Jr. said, "but it bends toward justice." 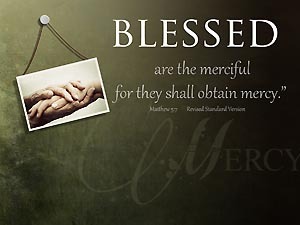 Blessed are the merciful ... for they shall receive mercy. According to Dear, "Mercy, like love and peace, begins with ourselves. We learn to let ourselves off the hook, forgive ourselves, and be kind and nonviolent to ourselves." "Mercy is a way to describe the mystery of forgiveness. According to Jesus, 'Mercy is what pleases me, not sacrifice' (Matt. 9:13, 12:7)...Mercy is a loving allowing, a willing breaking of the rules by the One who made the rules - a wink and a smile..." writes Richard Rohr. The politics of mercy involves forgiving those who have hurt us or those we love. Jesus demonstrates this in his response to the woman caught in adultery and her male religious accusers as he doodles in the sand saying "Let the one without sin be the first to throw a stone." Dear views this as a "creative nonviolent response." "The root of the word mercy comes from 'merc', which gives us 'commerce' and 'merchant'...Exchange is the very nature of divine life...According to modern neuroscience, all things share in divine life through participation in this dance of giving and receiving...This Beatitude invites us into a deep trust of God's flow," writes Cynthia Bourgeault. Dear reminds readers, "At the end of his journal The Sign of Jonas, Thomas Merton defined God as 'Mercy within Mercy within Mercy.' For Jesus, that is the goal of each one of us, that we can be as merciful as God." 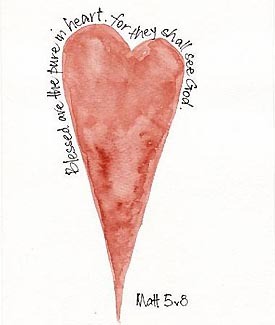 Blessed are the pure in heart ... for they shall see God. In this Beatitude Jesus points us to an inner innocence and childlike wonder that keeps us open to the presence of God, according to John. "The word purity set off alarms...For some purity connotes perfection...leading to self-righteouness, then judgmentalism of others" says Dear. Instead, he views inner purity as a process, a way of life rather than a static goal. "For Jesus, the heart is the center of life, literally, figuratively and spiritually." "The proper translation of this Beatitude is 'Blessed are those whose heart is not divided' or 'whose heart is a unified whole.' Jesus emerged from his baptism as the "ihidaya," meaning the "single one" in Aramaic - one who has unified his being and become "enlightened." According to Jesus, this enlightenment takes place primarily within the heart. When your heart becomes 'single' - that is, desires one thing only...then you 'see God'" writes Cynthia Bourgeault. "When the heart is right, seeing will be right. Jesus says, 'The lamp of your body is your eye.' When your eye is clear, your whole body is filled with light...What you always see in people who love God and themselves is the ability to make eye contact...So Jesus calls us to purity of heart with the promise that correct seeing will follow," writes Richard Rohr. "The pure in heart live in all-out pursuit of the things of the Kingdom and of the King Himself...wholehearted devotion will result in the reward of seeing God," writes Chris Tiegreen, Heaven on Earth. "If we dare go deep into purity of heart," writes Dear, "into inner peace, love and nonviolence, we will find ourselves living in the beatific vision, in the presence of God...and see God everywhere at all times in everyone and all things." 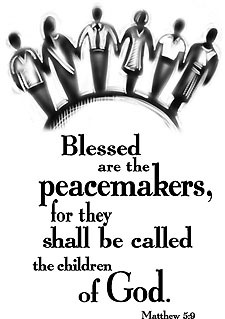 Blessed are the peacemakers ... they shall be called the children of God. "This is the only time the word 'peacemakers' is ever used in the whole Bible. A peacemaker literally is the "one who reconciles quarrels." Clearly you can see Jesus is not on the side of the violent, but on the side of the nonviolent...If you are truly consistently pro-life it means to be nonviolent - from womb to tomb," writes Richard Rohr. 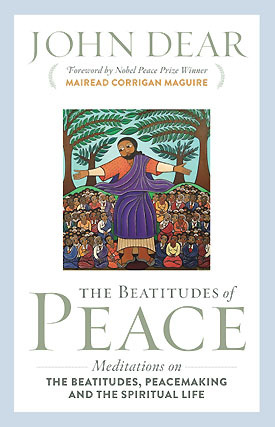 Dear views peacemaking as "the climax of the Beatitudes, and one of the key teachings of the gospel, yet for over 1,700 years it is also one of the most widely ignored...Jesus announces that God is a peacemaker and with this Beatitude, He calls us all to be peacemakers." Jesus redefines the very nature of God. "This one verse throws out thousands of years of belief in a violent god and every reference to the warmaking god in the Hebrew Scriptures. It does away with any spiritual justification for warfare," writes Dear. "Peacemakers are no longer wielding the sword that divides the world into good guys and bad guys, insiders and outsiders, winning team and losing team," writes Cynthia Bourgeault, "When the field of vision has been unified, the inner being comes to rest, and that inner peaceableness flows to the outer world as harmony and compassion." John Dear stresses the call to become grassroots peacemakers in every possible way; standing up against violence, war and injustice. He concludes, "As we consciously seek to become peacemakers and meditate on God as a peacemaker, we begin to understand our true selves as sons and daughters of the God of peace." "Blessed are those who make shalom, who seek restoration and wholeness in their lives, the lives of other, and the world at large...The true seekers of shalom, the peacemakers who will be happy, have a global focus. They pray for God's Kingdom of shalom to come here on earth, just as it is in heaven...and are called the children of God. We reflect the heart of our Father so thoroughly that we become vessels of His shalom everywhere," writes Chris Tiegreen, Heaven on Earth. 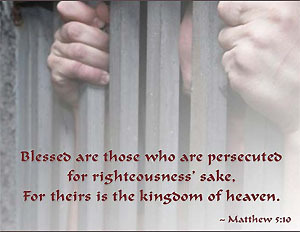 Blessed are those who are persecuted for the sake of justice ... for theirs is the kingdom of God. "In this closing Beatitude Jesus invites us to take bold risks just as he does in the nonviolent struggle of justice for the poor and oppressed," says Dear, "and he urges us to realize that, as with the poor in spirit in the first Beatitude, the reign of God is ours." "The first and last Beatitude are present tense. Theirs IS the Kingdom of heaven. Persecution has begun to happen to the believing community, and he's telling them to 'rejoice and be glad!' Persecution for the cause of justice is inevitable," writes Richard Rohr. "I am sending you like sheep in the midst of wolves," Jesus taught his twelve disciples. Yet His advice is "Do not be afraid." John explains, "These warnings appear throughout the four gospels...He gives the reason for the inevitable persecution; 'They do things because they have not known either the Father or me.' (John 16:2-3). This verse exposes what's at the heart of the world's violence, a lack of relationship with God, or a misguided view of God as violent. According to John, "Over the years, I decided that persecution was part of my job description as a follower of Jesus and a practitioner of the Beatitudes." Dear continues, "Christianity is the only religion with a spiritual teaching that insists on work for justice, peace and nonviolence - and trains you for the persecution that will follow...In this final Beatitude we learn the two primary emotions of nonviolent peacemakers - sorrow and joy." "Situations of persecution (or anything else that shakes us out of our egoic comfort zone) can become great teaching tools if we have the courage to use them that way," writes Cynthia Bourgeault. "The standards in the Kingdom aren't the same as the world system. Everything is measured differently. The goal isn't to reject as much temporary pain as possible in order to experience as much temporary pleasure as possible. It's to reach out for the true prize, whatever it costs," writes Chris Tiegreen. For me the biggest takeaway from John's reflections on the Beatitudes is that Jesus is the original peacemaker, and He is calling all of us to follow in His footsteps. This journey includes allowing the Spirit of God to do its inner work of transforming our hearts and well as inspiring us to find our place of service in God's Kingdom by reaching out, and prophetically speaking up, on behalf of the "least" among us. Dear explains the Hebrew word for "prophet" means "to speak for someone else." As we engage in speaking up for the poor, suffering, helpless and downtrodden in need of justice and peace we carry on the prophetic tradition. Brave souls, like John Dear, know that the prophet's earthly reward historically almost always includes persecution and/or premature death. John explains ten major characteristics of a true prophet, which include; listening to the word of God, centering on hearing from God, interpreting the signs of the times, siding with the poor and powerless, concern for justice and peace, confronting the status quo, living without the usual security, confronting religious complacency, embracing compassion and gentleness and offering hope. Dear believes that Christians from all traditions can and should follow Jesus in showing the world a "third way" beyond the typical divisive left-right politics as an alternative which seeks to serve as a bridge between both. As Richard Rohr says; the joy of serving as a bridge is that you get walked on from both sides. The goal is to end violence by transformation, a changing of the heart. John views Matt. 5:43-45 as Jesus' most revolutionary commandment; "You have heard is said, 'You shall love your countrymen and hate your enemy.' But I say to you, love your enemies and pray for those who persecute you..." as the pinnacle of the Sermon on the Mount. He goes so far as to say it sums up Christianity. I agree. Yet, sadly "we've done our best to avoid and disobey it," says Dear. Dear concludes with a rousing call to "arise and walk forth," which is another translation of the familiar "Blessed are..." or "Happy are..." preface to all of the Beatitudes. The key to spreading the message of nonviolence is that we embody the message and carry it everywhere we go. "As Beatitude people, Sermon on the Mount people, from now on we seek the kingdom of God first," prays John Dear. Oh for the day in which the entire earth will resonate with his message and say ... AMEN!